It’s been a while since we have overindulged ourselves with some self-portraiture. Art Deco fashion is the name of the game, and a fiction of winter life is the subject. Why is it a fiction? Because Dollissa would never use an umbrella. Also as if we ever would venture into the snow! But it’s pretty and we look good when drawn in it. Please note all of the lines in the sky. 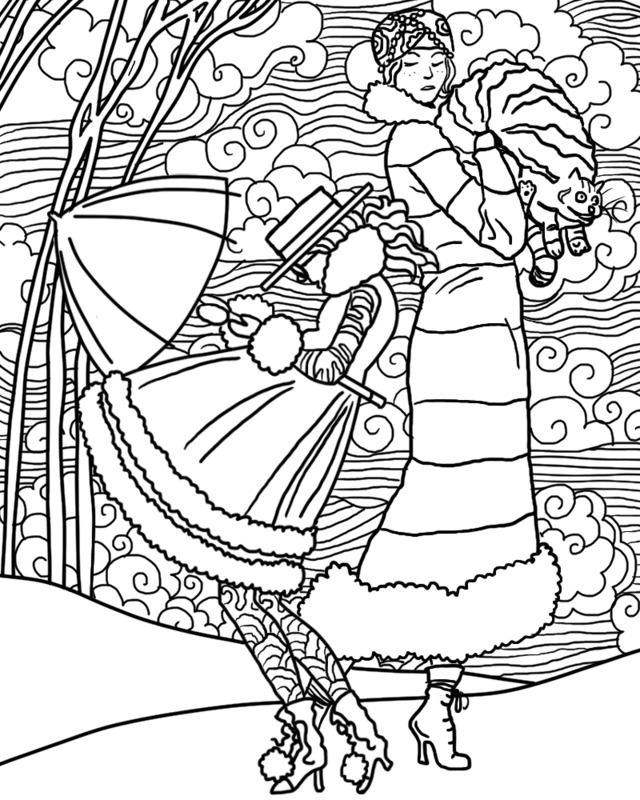 Not only are they there to give you something to color, but they represent the wind and unpleasant air. Also please note the fact that I have finally captured the Captain’s true personality. Please, print this out and color it in! Just like the title says, we want you to color us. Or, you can download this transparent png and color it in on some program that you use. Or you can hold out until we inevitably offer an entire coloring book of ourselves for purchase! Live your dream, with us.